Our machines heat water up to 230 degrees, providing adequate temperatures to kill bacteria and germs. We include very effective cleaning agents in our pre-spray and use a grooming rake to work our product in to ensure a safer and cleaner environment for everyone. Keeping your carpets clean improves air quality and keeps germs and bacteria down to low and safe levels. For our customers that have multilevel structures, we have portable extraction units that are ideal for better accessibility and convenience. Some structures may have 5 floors or more, and it is difficult to run that much hose especially through a busy office building. That’s why portable units are ideal for this application. First and foremost, we offer excellent customer service to all current and future customers. XSI Disaster Services takes pride in what we do and want to make sure all of our customers are completely satisfied. 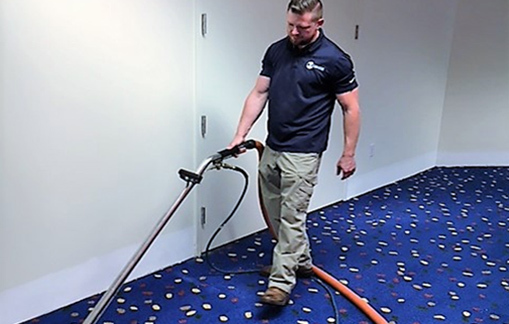 For expert Carpet Cleaning, call us today at 770-787-9096. Serving the Metro Atlanta area.